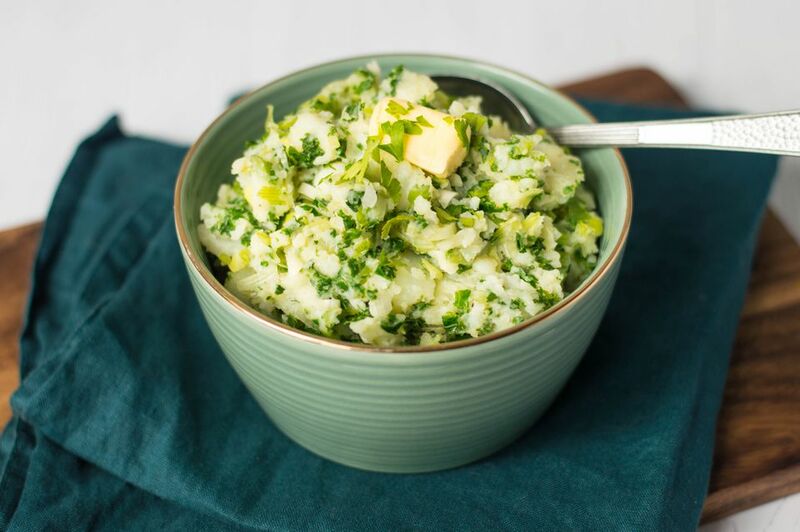 Colcannon is a favorite Irish recipe, especially on St Patrick's Day. Seriously, what is not to like? Creamy mashed potatoes, fresh, crunchy curly kale, a bit of spring onions, and pats of butter. Simmer the potatoes in lightly salted water until cooked—when pierced with a sharp knife, the potato will be soft in the middle. Blanch the curly kale in boiling water for 1 minute. Add the 1/2 cup of roughly chopped spring onions to the drained kale and pulse in a blender for 10 seconds. Drain the potatoes and add the butter. When the butter has melted, mash the potatoes until smooth and creamy. Add the kale mixture and mix. Finally, add 1/4 cup of finely chopped spring onions and season to taste. The dish is the perfect accompaniment to many traditional Irish dishes, not the least of which is a hearty Irish stew. Cabbage Colcannon: If finding fresh, seasonal kale is not possible, then it can be replaced with cabbage, although this will never be acceptable to a purist. Use a dark green leafy cabbage, such as savoy or spring cabbage, and finely shred it. Colcannon Cakes: A lovely and delicious alternative to colcannon is to shape it into cakes. These potato cakes make a delicious side dish in the same way the regular one does. You can top them with a poached egg and a dollop of hollandaise sauce in order to create a very sophisticated breakfast or brunch dish. Making the cakes is also a great way of using up leftovers. Bubble and Squeak: While not an Irish dish, bubble and squeak is the great British recipe that uses up leftover vegetables from a Sunday lunch, the backbone of which is mashed potato. The potato is fried in a pan with plenty of butter, salt, and pepper. Colcannon was traditionally used for predicting marriage on Halloween. Charms were hidden in the mashed potatoes and any unmarried girl who found one would place socks with spoonfuls of Colcannon and the charms on her front door handle. The first man to enter the house was her intended. Goodness, that must have been a worrying time waiting to see who arrived. The Ultimate Traditional Seville Orange Marmalade Recipe.